On Sunday august 6th, I am organizing a circular hike to Aiguille De Loriaz 2752 m.
It is a part of the Mont Blanc massif and located between this chain and the Aiguilles Rouges. 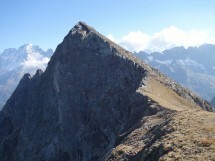 This impressive, isolated and uncrowded summit, overlooks the road from Chamonix to Martigny. We start from parking of Couteray (Vallorcine, Chamonix) and go up tu Chalets De Loriaz. We continue to Col and Pointe De La Terrasse. From here we cross a wild route on the ridge to the summit. Back to Col De La Terrasse and Lac Vert. Enter in the magnificent valley of Tré Les Eaux, at the below of Buet with it’s waterfalls. In the end of this valley, via Les Granges we arrive at Parking. This route is not too exposed or too dizzy. But there is a wild part, with small avoidable jumps. In spite of absence the difficulties, it is not an easy hike. Elevation gain about 1450 m. Distance about 18 km. Maximum 12 experimented and sporty hikers. Equipment: Good mountain shoes, hat, gloves, warm, cold and waterproof clothes, sticks, picnic, drink. etc… All participants must be well-prepared and have all equipment with them. If you are an Oxygene 74 member.